The Easy Mount assembly consists of base and cover into which are a pair of rubber to metal bonded flexible units sandwiched in an angular disposition. These are loaded in a combination of shear and compression for longest life and best load /deflection characteristics. Besides the desired vertical flexibility, easymounts are stiffer in the transverse direction as compared to flexibility in the horizontal direction. Full advantage of this characteristic is taken by disposing the mountings so that the greater flexibility is available in the direction in which it is needed. When three or more mountings are arranged symmetrically around a vertical axis, the flexibility of the suspension is the same in all direction. Such an arrangement is very useful for centrifuges, washing machines and other machinery revolving about a vertical axis. 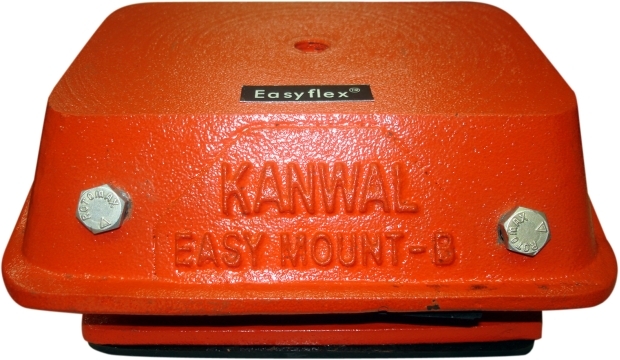 The mountings are designed to protect the rubber inserts from oil and physical damage. A levelling device can also be provided for machines requiring precision leveling. The pads are made in oil resisting rubber and can be used on all kinds of floor. The rubber friction pad provided at the bottom obviates the necessity of bolting the machine to floor. Easy Mounts can be conveniently arranged in tandem for doubling deflection for very low frequency vibrations.